EditiX XML Editor is an XML editor and XSLT debugger for Windows, Linux and Mac OS X designed to help web authors and application programmers take advantage of the latest XML and XML-related technologies such as XSLT / FO, DocBook and XSD Schema. EditiX provides users with an extensive range of XML functionality within a refined IDE that guides you with intelligent entry helpers. EditiX has realtime XPath location and syntax error detection. ...... EditiX XML Editor has realtime XPath location and syntax error detection. Helpers are also provided with context syntax popup supporting DTD, Schema and RelaxNG. 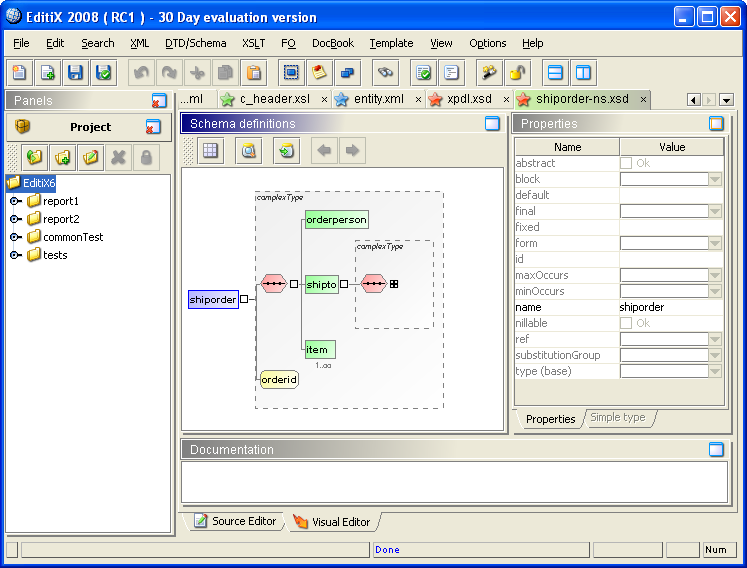 EditiX XML Editor supports multiple templates and project management. User can apply XSLT or FO Transformation and show the result with a dedicated view. All the process can be managed by shortcuts. Working locally is managed with OASIS XML Catalogs. EditiX XML Editor includes default templates with XML, DTD, XHTML, XSLT, XSD, XML RelaxNG, SVG, MathML and XML FO. Qweas is providing links to EditiX XML Editor 2012 as a courtesy, and makes no representations regarding EditiX XML Editor or any other applications or any information related thereto. Any questions, complaints or claims regarding this application EditiX XML Editor 2012 must be directed to the appropriate software vendor. You may click the publisher link of EditiX XML Editor on the top of this page to get more details about the vendor.